Epic news from the garage. Over the course of time I have told people about this blog and they say they will look it up. When I bump into them again the first thing they say is “What is that blog address again as I forgot it by the time I got home?” This prompted me to do something a little fun, I got some business cards made up with the details on of the blog, email, Facebook and Twitter. The people seem to like them and I have had a few more hits after I gave them out. What do you think? I am delighted with the day so far but I still can’t find that stupid brake flare adaptor! I was hoping it was going to drop out, but no that was too simple. Today was a small drive for a classic Mustang, but huge step for the project. 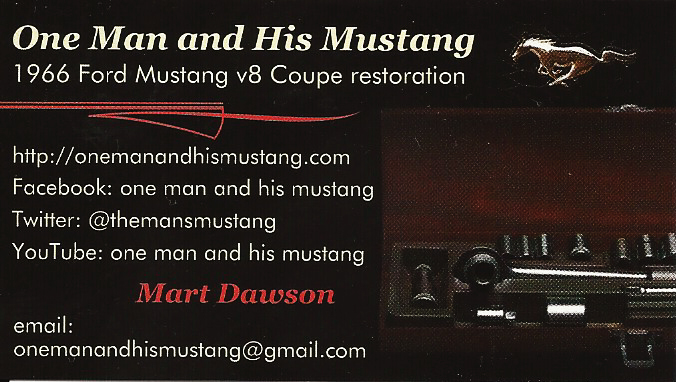 This entry was posted in Blog, Car and tagged animal, blog, brakes, business cards, dual master cylinder, fired up, flare adaptor, gearbox, heart, key, Mustang, neighbour, petrol heads, project. Bookmark the permalink. 11 Responses to She Moves! Howdy Mart Thanks for visiting. I luv classic cars. My friend also has a ’68 GTO he completely restored. Be watching my site as soon I will be putting a pic up! Blessings to you and have fun in your restoring endeavors. You won’t be disappointed. I will keep an eye out for GTO, if not drop my a quick email and I will get straight over to have a look. Good luck with the new business venture. I wish you well. Thanks for your well wishes, the same to u my friend! What a fantastic breakthrough on your quest to restore the life of a classic! Your hard work is paying off and that is exciting. The business card is a great idea and has a very catchy look. Good job! thanks for kind comment. It was an amazing day even if I did only move it a 10 odd meters or so. It was my achievement. The business cards seem to help and makes a little impression to remember. thanks again. So excited for you …will have to compare business cards! Wait til you see mine. Had them made several months ago. Hand them out when the moment’s right. Not sure if it has made a difference, but it sure looks official! Great minds and all that as they say. You will have to email me a pic of them.